Looking to give a gift this holiday season to a preschool aged kiddo? Read on for 11 great gift ideas that help to build fine motor skills in this age group. This post contains affiliate links. After the triplets had been home for about 2 months, I noticed that one of the boys had issues turning his neck to one side while nursing. He eventually worked it out, but as time progressed, I noticed that this extended to his right arm and hand. During the first few years of his life, the pediatrician and I watched him carefully. He was the “middle” baby in utero, and he had been squished between his two larger brothers. According to the pediatrician and other specialist, there was a chance that he could work out the right arm weakness over time. But by the time he turned three, there was little sign of improvement, and we found ourselves at the pediatric orthopedic specialist. Since that time, my son has been diagnosed with a mild brachial plexus injury, and he has spent the better part of the year in occupational therapy every other week. His right arm and hand usage has improved greatly, although it will never be completely normal unless a heavenly miracle occurs. My son loved his therapy sessions, but after talking to his physician (and after paying a ton of money for them), we decided to continue his therapy exercises at home. I had (and still have) mixed feelings about this. My son loved his therapy sessions and his therapist, and I liked to see the bi-monthly markers of his improvement. But the expense, coupled with my background in orthopedics and the mildness of his injury, made it more sensible to continue his therapy at home. Since I’ve been working with him at home, I’ve had to become vigilant at how to incorporate “exercises” for his right arm into every day life. This was something that I had never thought about with my other kids. With them, fine motor skills just “happened.” However, my son has to make an effort with his every day. He misses and still talks about some of the games and tools that he used in therapy, and so I decided that for Christmas, I’m adding some of these items to his Christmas list for him. I think that his brothers would enjoy and benefit from these items, too. If you’re looking for toys or games to help with a child’s fine motor skills, here is a list of 11 great toys for building fine motor skills in kids of the preschool age. All of the items below are either the exact same things that his therapist used with him or something very similar. I hope that you find this list helpful! Play Dough– My son used this almost every time in OT. All my boys are going though a Play Dough phase right now, and it is great practice for my son to work on kneading the dough with both hands. Dough Rolling Pin– The rolling pin forces my son to use both hands and arms to roll the dough. A full size rolling pin in a bit much for him, but if he uses just one of the plastic cylinders, he tends to “cheat” and only use one hand. This 12 piece dough set has three different rolling pins that would require him to use both hands. Stringing Beads– With this activity, my son has to hold the string with one hand and the bead with another in order to string the beads. It was an activity that he liked the least in OT, but I think it was because it was challenging for him. This is definitely an activity that I would like to continue at home, and I think his brothers would like it, as well. I like this set because it comes with a carrying tote. Nuts and bolts– My son enjoyed these during his therapy sessions. To screw the bolt onto the nut, it requires both hands. It was a great exercise for my kiddo. Giggle Wiggle Game– Have you seen this game advertised on TV? It looks like a fun family game, but it’s also a great OT activity. While this game doesn’t require two hands, my son uses the one that needs work to put the beads on the wiggly worm hands. He definitely giggles during this game, and it was his favorite. Lacing cards– This activity is similar to the stringing beads. Button Art– During his therapy sessions, the therapist had a flexible mat that my son had to use both hands to place button-type snaps into the mat. I’ve searched Google up and down, and I haven’t been able to find anything that matches what he used. The closest thing that I could find is the below button art. I liked the one that he used in therapy because it required two hands, but I think the one below would work if he focuses the activity on the correct hand. Cutting activities– Cutting requires two hands- one to hold the paper and one for the scissors. Play cash register– The therapist had almost this exact cash register. It seemed very simple to me, but for some reason my kiddo loved it during this therapy sessions. He had to place the coins in the slots and turn the handle with his weaker hand. Sorting pie– This is something similar to what my son used in therapy. The tweezers are excellent for his weaker hand. Balance Bike– At our last session, my son’s occupational therapist advised that he ride a tricycle or balance bike as part of his exercises. Even though this helps with overall balance, as well, it also forces him to engage both hands, arms, and shoulders. We already have one of the below balance bikes, but his brother rides it constantly. It would be great to have another. 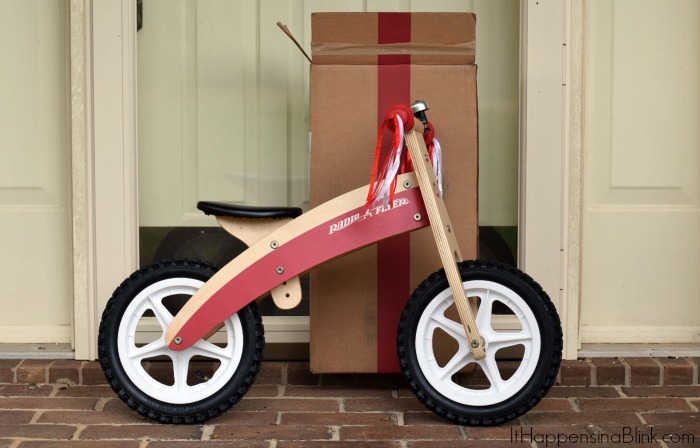 (To see a full review of the Radio Flyer Balance Bike, click here!). Do you have a child who has had occupational therapy sessions for fine motor skills? Would you add gift ideas to this list?